If you haven’t heard of smashed cucumber before, you’re in for a treat. It’s a technique popular in many parts of Asia - bash the cucumber, remove the seeds, and let the rough edges soak up the dressing. We’re serving our version with simple chicken and rice to let the rich flavours of the salad shine. 1. Bring a large saucepan of water to a simmer. Carefully add the chicken breasts and cook for 9-10 minutes until thoroughly cooked with no pink meat. Turn off the heat and carefully transfer the chicken to a chopping board. 2 Meanwhile, mix the garlic, vinegar, soy sauce and sesame and chilli oils (or flakes) in a large bowl. Place the cucumber halves on a chopping board, cut-side down. Using a rolling pin, bash all over until cracked in places, then scrape out and discard the seeds using a teaspoon. Roughly chop the cucumber and toss into the dressing with the celery and red onion. Stir through the cashews and coriander. 3. 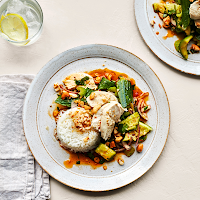 Divide the rice and cucumber salad between plates, then slice the poached chicken and arrange over the top. Short on time? Buy ready-cooked chicken breast fillets and slice over the salad just before serving.